ChatAdda is the best Indian Chat Room App on Play Store. Use ChatAdda for chatting with Indian girls, to meet girls or boys near you. Chat with local strangers and make new friends with ChatAdda. It's totally secure and gives you complete anonymity. Chat Adda is the best in free chat apps. It is the only chatting app with free private chatting with Indian girls. Use Chat Adda chat apps to meet girls. It's the best Indian chat room to meet new people. It is one kind of dating apps for India. Indian chatting app to meet girls, Indian chat with girls make friends and date meet near you, Indian chatting app with girls, Indian chat rooms with women, flirt chat with single girls in your area. ChatAdda is designed to generate as little data on servers as possible – this is a core part of our concept. 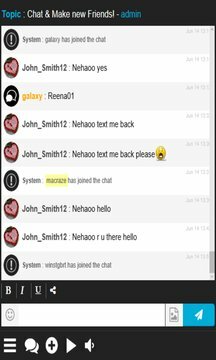 Chat room memberships and contact lists are managed on your device only, and never stored on our servers. Messages are immediately deleted after they have been delivered. Local files are stored encrypted on your mobile phone or tablet. All this effectively prevents the collection and misuse of your personal information, including metadata. • Users cannot take Screenshots of your chatting, private messages, pictures or any other chat room activities. • New features like live cam chatting, unlimited video calls and free voice calls coming soon! ChatAdda is not only an encrypted and private chat room but also versatile and feature-rich.